What do you think will be the most difficult part about living inside the Big Brother house: Being away from my daughter and not able to see her, hold her, or smell her. I can handle what the house has to offer, I’m just going to miss my baby. I've never been away from her for more than a few hours. Finish this sentence: My life’s motto is… Hakuna matata! We have literally only one life to live and I'm not going to spend mine stressed out and full of worries. What would you take into the house and why: A pic of my daughter or one of her blankets. I need to see or smell her in order to deal with not being around her. I need it for my sanity. Also, a T-shirt with my grandmother's picture on it since she's the reason I even auditioned and I want her to enjoy the experience with me. I’d also want my Bible. I know these people are going to push my buttons I need my Bible to keep from exploding. Da’Vonne comes from an extremely religious family. Her mother was a minister and her uncle is a pastor, but she has always gone against the grain. While her family was in church and Bible study, she was at the beach or out with her friends. Her grandmother was the person who understood her best and the one with whom she would watch Big Brother. 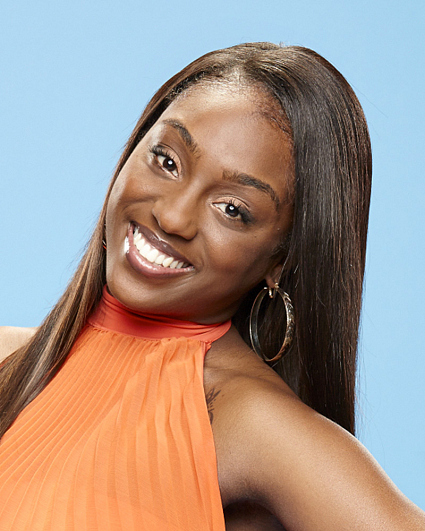 She encouraged Da’Vonne to apply for the show and the 27-year-old is ready to play! As a poker dealer, she has studied the game and done the competitions along with the Houseguests while watching the show. She knows she needs to learn each person well, even though she doesn't like to team-up with people. She knows she can only trust herself. A super tomboy growing up, she is a strong woman and a single mom. Not worried about the opinions of others, she is doing this for her daughter, hoping to win the money for her future! Watch Da'Vonne's bio video here!